Alright I know there’s still 6 more months to go till the end of this year, but I really think this is going to be the best meal of the year for me! We decided to have a mini birthday celebration for Dad awhile back before my exams. Last minute reservations on a saturday night is really not a good idea. 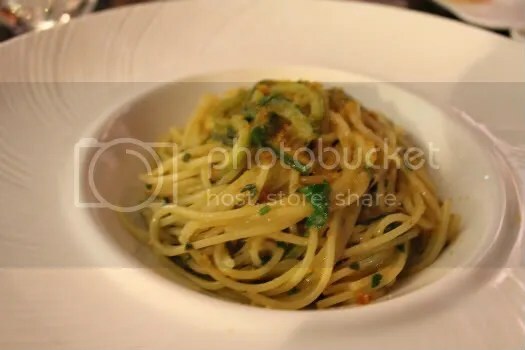 We tried various places- pasta brava, morton’s etc but they were all fully booked. Finally after so many rejections, we managed to snag some outdoor seats at OTTO Ristorante. The whole restaurant is pretty small, and the alfresco area only has a few small tables (but I believe they are expanding). 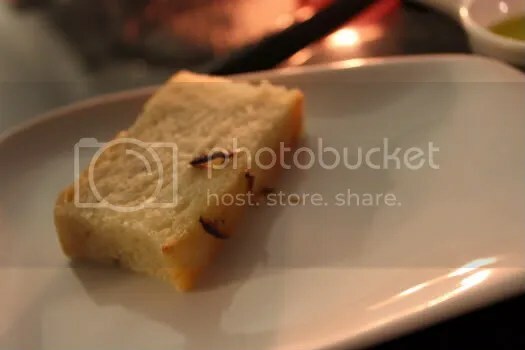 Complimentary bread was served first, cold. That gripe aside, the bread was alright. The one with a few strands of sauteed onion on top tasted muffin-like. Good enough to nibble on I guess. But definitely way below the standards of many fine dining areas. Thank goodness it was the only bad thing that happened. 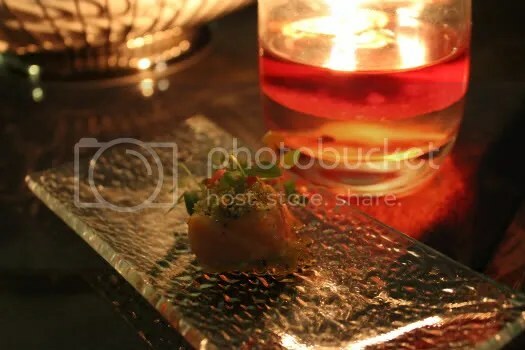 Our amuse bouche was a small chunk of salmon with some sort of savoury pastry crumb and tomato sauce. It wasn’t overcooked, thankfully. Very soft and flakey with all the omega-3 rich oils. The play of textures between the soft salmon flesh and the grainy crumb was simple but much appreciated. 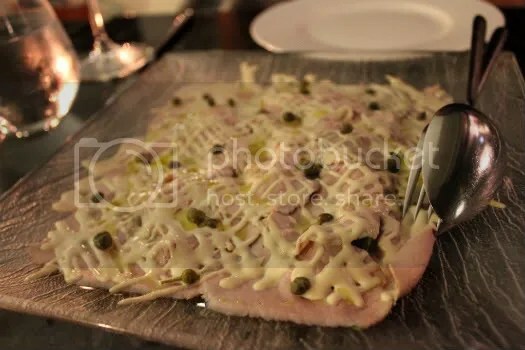 Classico Vitello Tonnato con Cappari di Pantelleria- Classic roasted veal tonnato with Pantelleria capers and tuna sauce. 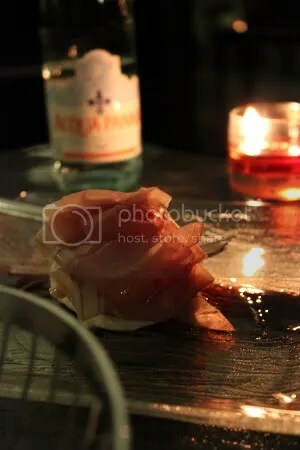 For our antipasti, Lucas recommended this saying it was a classic Italian dish. I concur, this dish is a must-try. The thin shavings of veal tasted a lot like ham, just less salty and much leaner. Special mention goes to the capers which didn’t taste as sourish as what I usually perceive them to be. Balance everything on top of a small slice of bread and you are good to go! This was a special for the day, alas I didn’t catch the full name. 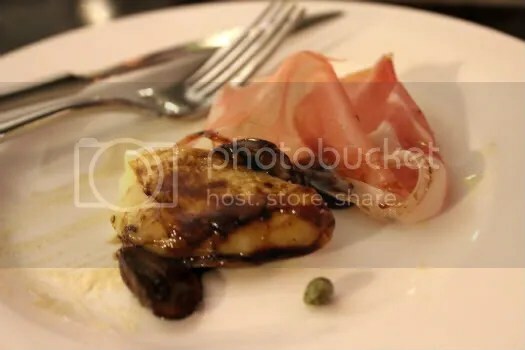 Basically, deconstructed it’s shavings of parma ham, grilled buffalo mozzarrella, sauteed mushrooms and a balsamic glaze. As much as I love buffalo mozzarrella and mushrooms, I still prefer the former appetizer. Buffalo mozzarella tastes good on its own au naturel in my opinion, grilling it loses the delicious milkiness of the cheese and somehow or rather, I like it better served chilled. Order Valentino’s braided buffalo mozzarella, then you’ll know what I mean! And now, moving on to the mains which were really the stars of the night. 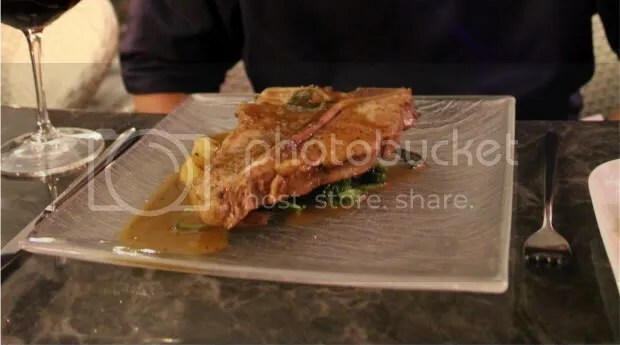 Technicalities aside, the meat was tender to cut, and juicy as you chew on it.It is not available on the usual menu, so you will have to check if it’s available for the day. I’m not normally a person who enjoys slabs of meat, but this really changed my mind! 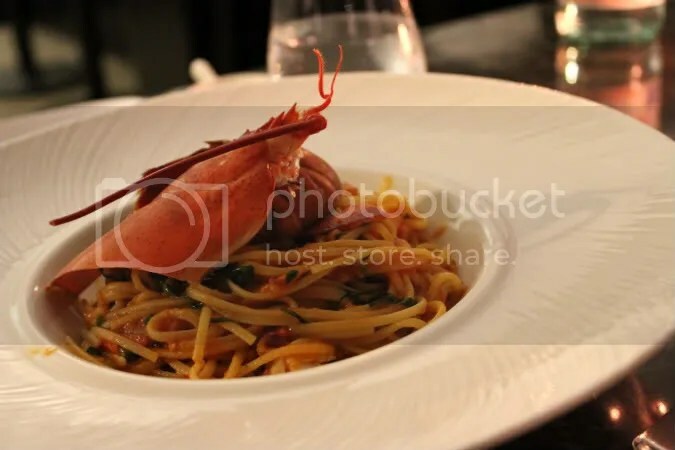 Mum’s Linguine Boston Lobster in spicy light tomato gravy was another winner in terms of both presentation and taste. Plus, they were pretty generous with the lobster chunks. I ordered the spaghetti with sea urchin and grey mullet bottarga. It tasted pretty mundane at the start, but curiously it tasted better and better all the way till the end. The umami pasta sauce was excellent and very very addictive. The sauce had just the right level of creaminess, primarily due to the sea urchin. The spaghetti itself was al dente, the way I like it (as compared to mum’s linguine mine had much more bite to it). The ingredients were simple, there was no meat but really, who needs any distractions when the pasta sauce itself is so tasty? Definitely, a must-try. The staff knew it was dad’s birthday, so they surprised us with a small cake and a birthday song. Thank you! I have no idea what cake it was but suffice to say we finished it all up, every crumb. The cake itself seemed like a cross between a mousse and a light angel cake. The gritty and crunchy chocolate soil by the side added a nice dimension and oh, the semi-sweet dark chocolate sauce was divine. We had desserts as well. Nothing like some sugar to satisfy the sweet tooth! 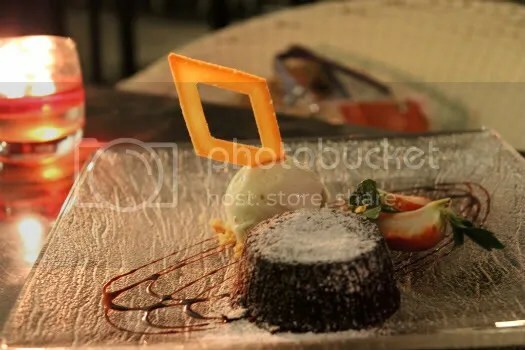 We haven’t had molten chocolate cake for the longest time. The last time we had it was at au petit salut, served with dark chocolate sorbet (had good memories of that one!). 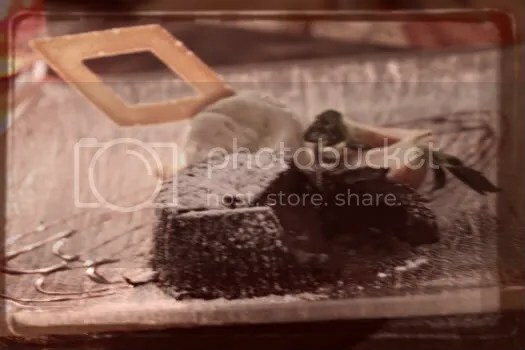 Lots of places get so preoccupied with achieving the molten centre that they undercook the cakes, leaving an extremely thin shell to hold the chocolate within. That’s good I guess if you really like chocolate batter… but for me nah. I rather more cake and less molten chocolate! The pastry chef here didn’t overdo it at all. 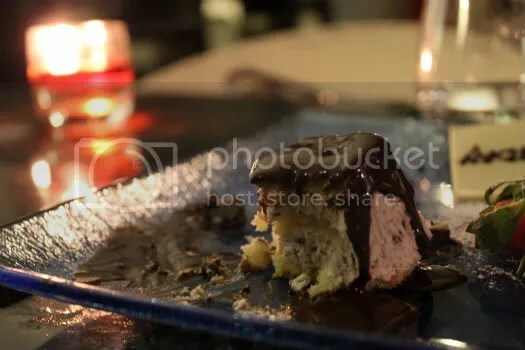 The cake was really bitter on its own, but smothering it with some of the piping hot chocolate sauce and a small chunk of cold vanilla Haitian ice-cream brought us to chocolate heaven! 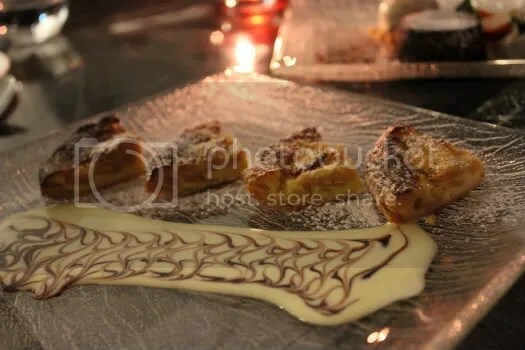 Dad recommended the apple and hazelnut puff pastry tart with cinnamon sauce. This was a pretty light dessert, as compared to the other two but no less spectacular. 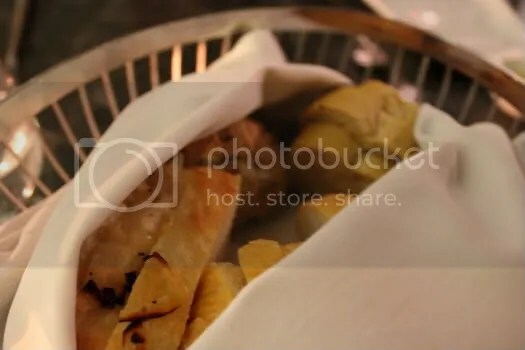 Don’t forget to drench the apple and hazelnut puff pastry tart with the cinnamon sauce. It’s that good. All in all, a very satisfying meal. Great service, and thanks to the lovely drizzle we weren’t too uncomfortable dining al fresco. It’s a great place for special occasions, but don’t forget to make a reservation, especially if you want to sit inside!